ROI Call Center Solutions has experience with several types of Interactive Voice Response (IVR) systems to support our live-operator inbound call center services. We support several types of applications, including forced pre-call messages, information delivery, menu routing, warm transfers, and others. 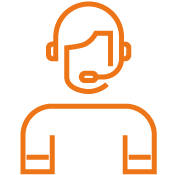 We have IVR capabilities on site through our various technology platforms in conjunction with live operator programs to assist clients in reducing costs associated with basic and/or repetitive call requests. We primarily utilize our IVR system for front-end messages or call routing options (i.e., press 1 for customer service, press 2 for sales, etc.). An interactive voice response system is the comforting voice at the beginning of a call that prompts you to “press 1 to talk with a customer service representative.” It allows you to channel customers through a customized phone experience, so they can be connected to the most appropriate person. Ultimately, it decreases the frustration of your callers and allows you to reduce costs by streamlining your customer service process. Used in call centers, doctors’ offices, and a variety of other business settings, an IVR service collects information and allows a customer to reach the right person for the help they’re after. The system may include touch-tone keypad selection or voice recognition to direct the call. Businesses can add many other features to better the IVR experience for customers. Choosing to use an IVR system for your call center has numerous benefits for both you and your customers. Your customers will enjoy being directed to the right customer service representative from the start, rather than being passed from person to person and getting put on hold multiple times. They won’t have to wait for someone to pick up the phone and can get fast answers to their questions. This will reduce their frustration and increase customer satisfaction and loyalty. Also known as a pre-call announcement, this is a service that plays a pre-recorded message for customers. The message can promote a special deal, deliver information about an event, give weather-related business hours, and more. Interactive voice response is commonly used for menu or call routing, in which a customer is able to choose from a menu of options to get them in contact with the right department or get the information they are seeking. A warm transfer allows customers to speak with a person on your team before they are transferred to the department they’d like to talk to. The employee has a chance to gather background information and then relay that to the relevant department.